Pu3 'n this CrazyLife . : Happy Mom’s Day ! Happy Mom's Day to every mom in this whole world..
And especially my mom and my grandmother.. Without you all, I'm nothing..
And with you and your pray, I can be everything..
more than 9 months she's carrying me, and with difficulty gave birth to me. We rarely together, like another daughter n mom always do.. But you always can make me stronger with your words.. Make me get my spirit back to through this life.. I'll do my best to make you proud, someday..
And your pray mean everything to me..
she was the one that replaces the role of mama since I was a baby..
she always took care of and always spoiling me .. 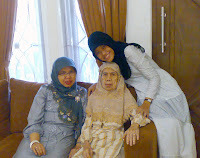 I'm also very fond of her ..
now grandmother had entered his old age. the situation turned around, it's time I take care of him too ..
like he took care of the time I was a kid.. Thanks for always loving and caring me..
PutriDianzara. Picture Window theme. Powered by Blogger.